J&K Grameen Bank under the chairmanship of Sh. Janak Raj Angural conducted “ RuPay Big Bazaar Sabse Saste 5 Din Campaign“ on 24th , 25th and 26th January 2019, the year’s most economical three days of shopping with Future group at Big Bazaar outlet store, City square Mall, Jammu by providing rock bottom mega deals & discounts on J&K Grameen Bank’s Rupay Card. This was done in collaboration with National Payments Corporation of India (NPCI). The Campaign was launched by Bank’s Officials from Information & Technology Department, Financial Inclusion Department, Regional Office Jammu and Regional Office Kathua/Samba. Apart from the discounts on JKGB RuPay Card, the customers were made aware about the other digital products provided by the Bank like IMPS service, SMS Alert Service, Card transactions across POS and E-Commerce benefit, NEFT-RTGS, usage of POS Terminals. Various deposit schemes, loan schemes, social security schemes like (PMJJBY),(PMSBY) ,(APY) were also informed to the walk-in customers. Bank’s IT Team highlighted the continuing efforts of J&K Grameen Bank to provide the best shopping deals and savings to empower consumers and create abundance. J&K Grameen Bank made earnest efforts to make this years' Republic Day weekend shopping, truly memorable, with rock bottom discounts on JKGB RuPay Card . Mrs.Jyotsna Garib HOD IT Department J&K Grameen Bank, put forth the various digital schemes of the Bank and enlightened the customers regarding the benefits involved in the usage of digital products. Mr Naresh Kumar ,Ms Anuradha Bhat, Ms Sonia Bhasin and Mr. Rohit Gupta from IT- Department also told them the merits and demerits of using such services and precautions to be taken care of while utilizing such facility and advised people not to trap in the fake calls which is very common trend used by some fraudulent persons active in the market. 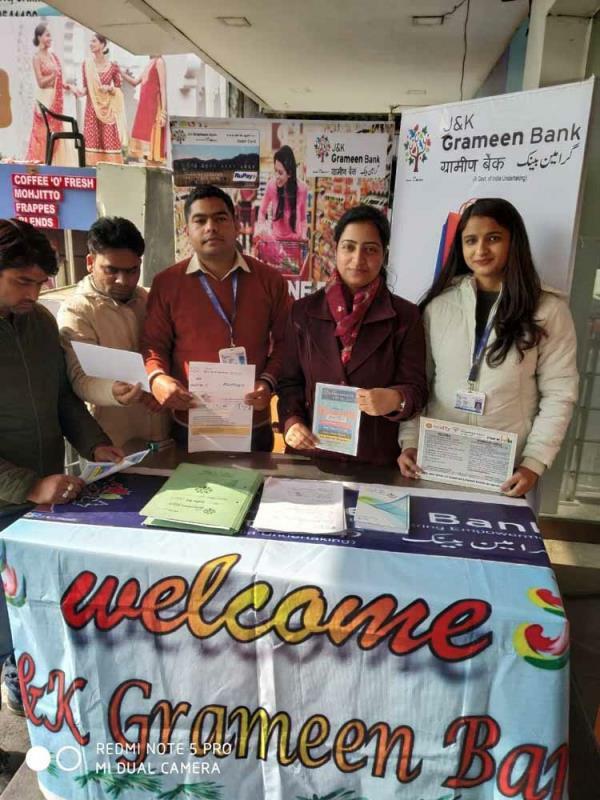 Mr. R.K. Narang Regional Manager Jammu and Ms. Vasbhi Dewan, Digital Marketing Officer, RO Jammu, Mr. Dev Raj Sharma, Digital Marketing Officer RO Kathua/Samba make consumer aware of Various deposit schemes, loan schemes of the J&K Grameen Bank. Ms Priyanka Sharma Associate Executive IT from Financial Inclusion Department informed the masses about the benefits of Social security schemes like Pradhan mantri Jeevan Jyoti Yojna, Pradhan mantri Surksha Bima Yojna , Pradhan mantri Jhan Dhan Yojna and Atal Pension Yojna available with J&K Grameen bank.